The Spire is a hotel is modest in size, but packs its weight in luxury. Take your pick of the 10 spacious rooms available to rest between adventures into the heart of Queenstown. Whether you feel like sampling the excellent menu of the Thai restaurant, relaxing in the bespoke furnishings of your room, or sipping sumptuous cocktails in the in-house bar, the contemporary surroundings of Australasia’s leading boutique hotel are hard to beat. The Spire is surrounded by attractions waiting to be explored. From wakeboarding to blissful cruises, the lake itself is a hotbed for activities. A stone’s throw away lays the lighting-shaped Lake Wakatipu, bordered by pine-tree encrusted hills. Close by, the beautiful Ben Loman reserve and Queenstown Gardens are within walking distance. Or for the truly adventurous heli-surfing is a short flight away. Clean lines and luxurious materials are par for the course at the Spire. Each room comes equipped with all the contemporary amenities the discerning traveler is to expect, abound with bespoke leather chairs and plush fur pillows. After a hard day discovering the wonders of Queenstown, crash onto the soft white Egyptian cotton sheets for the perfect end to your experience. This boutique hotel may be small, but it never compromises on sophistication. The welcoming staff are ever on hand to help you out, from planning your next mini-expedition around the city or just to order some of the hotel’s exquisite room service. 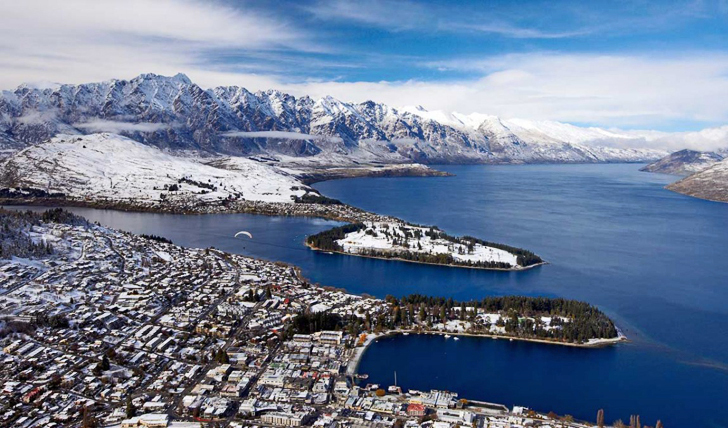 We love that that the hotel itself is integrated into the community of Queentown, and has become a popular destination for both locals and newcomers alike. Once you’ve stayed a night in The Spire, you’ll find yourself hard-pressed to leave.